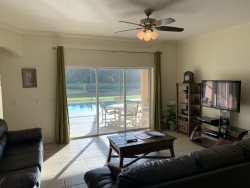 Paradise Resort Vacations specializes in managing and marketing short-term vacation rentals primarily in the Orlando area of Florida.Our staff is dedicated to customer satisfaction 24/7 .We offer excellent services to our homeowners. Our aim is to take the stress out of owning a vacation home! Our goal is to maintain and clean your home to such a standard that, we have highly satisfied guests, who will become repeat visitors.We realize an important element of this is proper maintenance. A home kept in great condition is certain to attract repeat business. For security reasons Paradise Resort Vacations does not employ contract cleaning companies.Our housekeepers are background checked. They have many years of experience in vacation home cleaning. They are assigned to your home and get to know its contents extremely well. Our maintenance team have a background in construction. This allows them to deal with most home maintenance issues.Please call us if you want to learn more about what home improvements we can do for you. We realize the importance of good communications. We will keep you informed of anything happening at your home. We will schedule cleanings and minor repairs.We are here to deal with any emergencies and will diagnose the problem and contact you to discuss any major issues.There will be no expensive surprises at the end of the month.